My Wife and I took a very nice trip on this sloop with the captain and his mate for a day cruise with about 10 other folks. Of course the British Virgin islands provide a great back drop for a leisure cruise through the many islands. We went from Virgin Gorda past the Dogs and out to Cooper for a swim and snorkel before lunch onshore there at the club restaurant. The whole way we were spoiled with the shipside amenities drinks / snacks, and the captain's tales of his islands cruises the for 25 years. All in all it was a real nice laid back day cruise, just the thing to pass the day when you're on vacation. This was the kind of getaway day I go to the Caribbean for in the middle of a long Midwestern Winter. 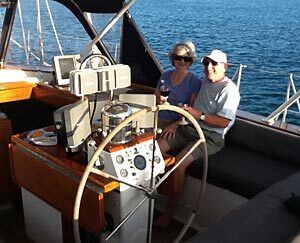 La Boheme Charters offers half day, full day, and sunset charters. The Gulfstar 60, La Boheme, is located at the Virgin Gorda Yacht Harbour of Spanish Town, Virgin Gorda, British Virgin Islands. Contact us at any time to arrange for the day sail of your choice. If you do not have snorkel equipment, we can provide it for you. We also provide beach towels. Just show up with your bathing suits and sun block and you should be all set! Bottled water, juice, soda, beer, and wine are available. Hors d'oeuvres are served which may consist of Hot Artichoke Dip with crackers, conch fritters, and a fruit platter. The day sail can be tailored to your liking. 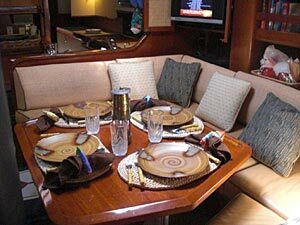 You can make arrangements prior to the trip or simply board the boat and let the captain help you decide on a whim. La Boheme from False Fiction on Vimeo. Morning half day charters start at 8:30 and end at 12:30. Afternoon half day charters begin at 1:30 and end at 5:30. 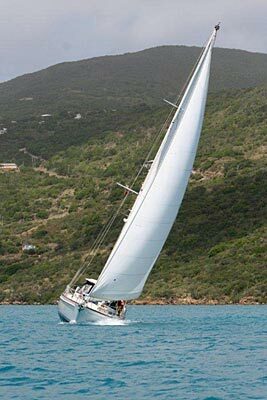 Your group will meet the captain at the Virgin Gorda Yacht Harbour and board La Boheme at approximately 8:30 (or 1:30). The Captain will give you a few ideas for your customized itinerary and then set sail promptly. You may choose to sail to Cooper Island. Once there, your group will most likely climb into the dinghy and head over to Salt Island for a snorkel on the famous Wreck of the Rhone. You may prefer to kayak around the anchorage or simply soak up the sun's rays on a float. The sturdy swim ladder makes it easy to get in and out of the water and dinghy. After that you will head back to the boat for a quick rinse off with the deck shower. Then relax in the cockpit with a refreshingly cool beverage and cheese and crackers. 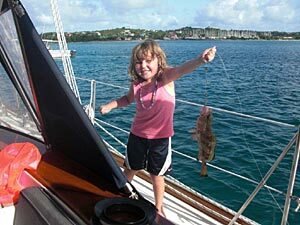 The captain will then pull the anchor and head off for another beautiful sail back to Spanish Town, Virgin Gorda. 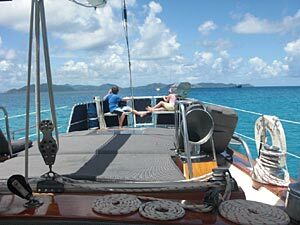 Your group will board the boat at 9:00 in the Virgin Gorda Yacht Harbor. You may choose to sail to the coral island of Anegada. You will arrive at Anegada around 11:00. Everyone will hop into the dinghy and head to shore by the Anegada Reef Hotel. Taxis are available to take you on a tour of the island. You may sit at the Anegada Reef Hotel beach bar to chat for a bit and have lunch, or taxi over to the north side of the island where you can have a delicious meal at the Big Bamboo located at Loblolly Bay. Snorkeling is wonderful there and the view is simply gorgeous! It will draw you back if you are ever given the opportunity another time. While driving back, you may have the chance to catch a glimpse of the flamingos that inhabit the island. They are quite a sight! When back on board, your party will enjoy refreshing drinks along with hors d'oeuvres before another magnificent sail back to Virgin Gorda, where you will arrive at approximately 5 o'clock. The sunset cruise departs at 4:30. You will experience the most resplendent sunset over Tortola while you gently glide over the Sir Francis Drake Channel. The trade winds will fill the sails and allow you to feel that peaceful connection with the wind and sea. Having a cocktail or two while snacking on conch fritters is really a lovely way to end a day in the British Virgin Islands. The time of the sunset varies depending upon the time of the year. The entire sunset cruise should last about two hours. Please email us at information@labohemecharters.com or call in the BVI 284-547-7244 or in the USA 339-526-9700 and we will be happy to provide rates and arrange bookings. 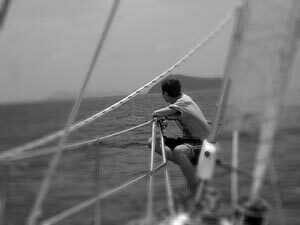 Also, please visit our other website, Bowline Yachts Ltd.. If you plan to go sailing in the Caribbean, you have an idyllic vacation ahead of you. Whether you choose to borrow a small boat from your hotel or plan to rent a fully-crewed yacht and explore for a week or two, this is a chance to move at your own pace, surrounded by sea and sky. You'll be able to enjoy beaches and coves that landlubbers can't reach and to see the islands as Columbus did hundreds of years ago. The following islands offer some of the best sailing in the Caribbean. Often referred to as the sailing capital of the Caribbean, the British Virgin Islands offer nearly perfect sailing conditions: consistent trade winds blowing from the northeast at 10 to 25 knots, clear water and about 60 islands and cays to explore in an area that's 32 miles long and 15 miles wide. Tortola, the largest island, is the main starting point, and many operators are available to rent bareboat craft or crewed yachts, depending on your skills and interests. More than 100 yachts take part in the BVI Spring Regatta, a three-day festival that's one of the most exciting sailing events in the Caribbean.